You have bought an eBook and would like to read it on a device of your choice? Attention: not all eBooks could be used on all reading devices! The trap is called “DRM”. Most of the publishers and providers tried to use this protection in order to prevent unauthorized distribution of the eBooks, thus causing anger among the readers – so they have been increasingly taking a stand against it. Among the opponents are the science fiction publishing house Tor Books, the fiction publishers Carl Hanser, Gmeiner and Bastei Lübbe and the non-fiction publisher O’Reilly. We have also decided to stand against DRM: XinXii is “ DRM-free” and supports the initiative of the same name of the Free Software Foundation. „DRM“ (Digital Rights Management) is a method with which the use and distribution of digital media is controlled; mainly DRM is applied to movies, music and eBooks (more information about the technical background can be found here) – primarily through binding the data format with the reading device or requesting a registration or authentication process for validation of the book purchase’s legitimacy. Restriction: DRM protected eBooks could not be read on all reading devices per se, since not every reading device is compatible with the DRM protection set by the publisher or the provider. Incompatibility: DRM protected eBooks could not be transferred or added to other reading devices per se. Constraint in the usage could be distinctive, for example there is a copy prohibition (prohibition to make a backup copy, limitations of the number of copies, printout not possible). It is not a secret: DRM can be “circumvented” – relatively easy by those people who in the first place create illegal distribution. And not least- with DRM protected eBooks you do not know whether you can transfer the eBook to your new device. 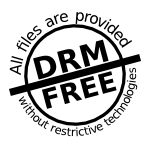 The campaign „DRM-Free“ is an initiative of the Free Software Foundation, which commits to unrestricted and free access to digital content with the following note: „Individuals, companies and organizations have come with the realisation that DRM constitutes an unnecessary restriction”. The FSF has introduced a label on its website „Defective by Design“ which can serve those providers who have renounced copy protection and offer their users DRM-free content. The label indicates that DRM-free content is offered. So far it was hard for the users to find out (before the purchase) the use restrictions that the eBook is subject to, since this information was not available in full scope or easily recognizable on the eBook shops. All authors and readers, who would like to express their opinion against DRM, can support the initiative and receive here the source code of the official logo for their blog or website. We know from our own experience with various data formats and reading devices that DRM is a constant annoyance. We support the campaign because we would like to guarantee all XinXii users an easy access as well as unrestricted usage of their purchased eBooks, meaning that a legitimately acquired eBook could be read on any device without additional authentication. Here you can find a list of providers and companies which participate in the campaign and you can download DRM free data with them. Why the death of DRM would be good news for readers, writers and publishers?